Our Winter 2018 Tax Newsletter is now available! Clients can expect our Newsletter to be attached to an email which will be arriving soon. 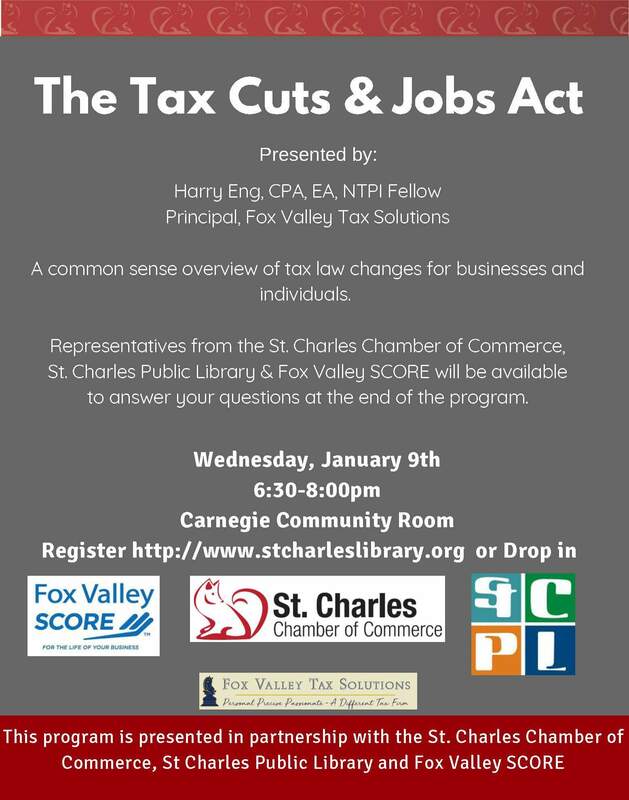 Everyone is welcome to hang out with us for a free tax presentation at the St Charles Library on January 9th at 6:30 PM. 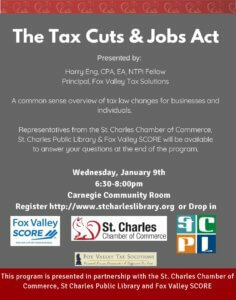 Harry is the guest speaker and the event is sponsored by the St Charles Chamber of Commerce and SCORE. This is a no cost way to get caught up on tax changes this year. Bring your tax questions! Feel free to drop in or click here to sign up for the event. For years, we have been advising clients about the benefits of the ‘Backdoor Roth’ strategy. Lack of IRS guidance had clouded the issue with many. Congress has finally put it’s finger on the scale with a few footnotes in the recent Tax Reform Bill. Tax reform has both added and removed tax reduction opportunities for businesses in 2018. While the resulting tax code writing and interpretation will go on for quite some time, it is never too early to bounce the changes off of how you operate your business. Check out our Special Edition Newsletter for some details. We are contacting selected clients regarding a tax saving opportunity that is now available as a result of tax reform (Tax Cuts and Jobs Act) that was passed today. You may benefit from prepaying your property taxes. This legislation has limited the deductibility of property taxes for 2018 and beyond. In certain scenarios, it will be beneficial to pay your 2018 property tax bill before the end of 2017 and capture the deduction before it is lost. Please contact us if you would like us to analyze your specific situation to determine if prepaying your property taxes will be beneficial. Why is my paycheck lower this month? The Illinois state legislature has recently enacted several ways for all of us to help with its fiscal problems – in the form of new tax law associated with the recent budget. Wage earners will notice more withholding starting in July. Those making estimated payments on the state level may need to adjust those amounts. Give us a call if you you have any questions or would just like to participate with us in the time-honored tradition of complaining about taxes. Matters of the heart and tax matters normally need to be considered separately. That being said, it is good to be armed with the facts. The term ‘Marriage Penalty’ is thrown around a lot but this article breaks it down with some humor added for good measure. Taxes and humor…. who knew? Who can be a dependent? It is pretty well known that parents can take their children as dependents while they are in college. What about after college if they take a while to get started? What about parents that you support? Here is a good article on point: Who can be a dependent? As always, give us a call if you need more on this. We have touched on this topic before but scammers are continuing to evolve. We still hate these guys. The IRS recently finished a Security Summit. The takeaways? This last one is important and we take it seriously. At Fox Valley Tax Solutions we have implemented an Information Security Plan recommended by the IRS to ensure we are doing our part to safeguard Taxpayer Data. Not all tax preparers are up to speed on this! Did we mention we hate these guys?